Sen. John McCain, who has long been identified in the media as a self-professed "maverick," says in a new interview that he never thought the word applied to him. "I never considered myself a maverick," McCain told Newsweek. "I consider myself a person who serves the people of Arizona to the best of his abilities." That's a striking comment in light of the number of times that the former Republican presidential candidate has embraced the term; at a town hall meeting in Michigan in September of 2008, he said, "Sarah [Palin] and I don't agree on every issue -- what do you expect of two mavericks? To agree on everything?" The McCain campaign also ran an ad during the presidential campaign calling McCain "the original maverick." (check it out above.) There was also a spot in which McCain and Palin are identified as "the original mavericks," which you can see here. McCain even referred to himself a maverick on an appearance on "Saturday Night Live" shortly before the election. At a campaign really for McCain on March 26th, Palin asked Arizona voters to "send the maverick back to the United States Senate" as McCain looked on. She told the crowd that McCain's "maverick" status hasn't won him friends from the "Washington D.C. elite machine." One reason McCain may be shedding the "maverick" label is that it doesn't play well with Republican primary voters. 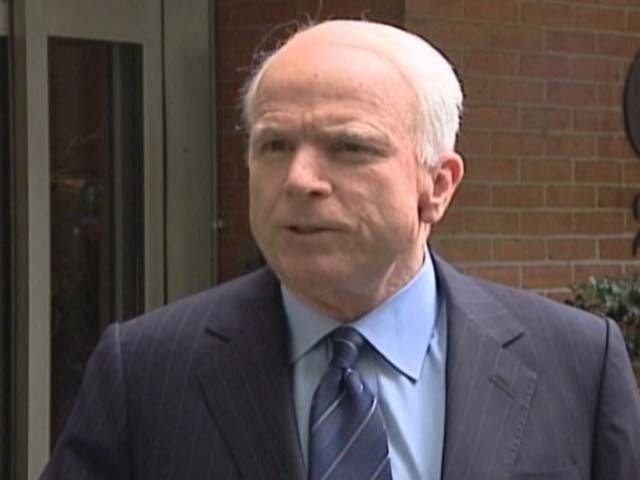 McCain is facing a primary challenge from former congressman J.D. Hayworth, who has deemed McCain less than a true conservative. His image as a maverick may play into Hayworth's hands because it suggests McCain has been willing to break with his party and work with Democrats on issues like immigration.